1. Choose a large pumpkin and use a sharp serrated knife to cut off the crown, approximately 2 inches from the stem and save for later. Always cut away from you in case the knife slips. 2. Using a large serving spoon, hollow out the pumpkin using a spoon, scooping out the seeds and fibres and then remove some of the flesh and either set all the bits to one side in case you want to try your hand at baking a pumpkin pie or making pumpkin soup later. If not simply throw it away. 3. With a marker pen, draw your outline on the pumpkin. 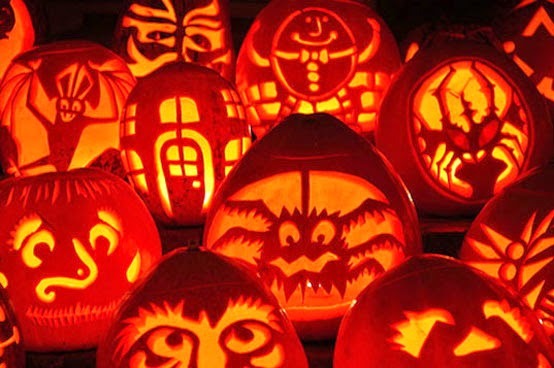 Use either small serrated knife to cut out your design or use pumpkin carving tools if you’ve designed something more intricate. 4. Pop a tea light inside the pumpkin and light it and replace the crown. Or to add a new dimension to a simply style why not put multi coloured Christmas lights inside. Looking of inspiration or simply want to see some extreme pumpkin carving... watch two divers compete in an underwater pumpkin carve off in the Sealife Centre in London.